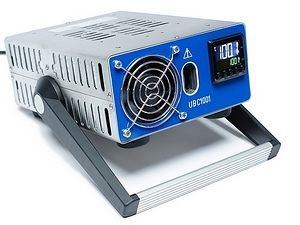 The UBC1001 is a sub-zero block calibrator designed to be portable, simple and convenient to use. It uses solid-state peltiers to cool the block, down to 35 degrees below ambient, and so doesn't need any refrigerant or compressors. It has two 13mm clearance pockets in its block, these can be used with any of the four supplied sleeves, which each have a different size pocket, in order to accommodate different probe sizes. This Standard Kit version includes 4 different sleeve sizes to fit common probe sizes and a carry case, for other sleeve sizes and options please contact us for a price. Case Included - Aluminium flight case with shaped foam lining. Sleeves/Inserts: 13mm UniSleeves sizes 3.2mm, 4.7mm, 6.5mm, 9.5mm included in this kit as standard. Carry Case: Foam lined aluminium flight case included in this kit as standard. The calibration of the block calibrator in both wells at 3 temperatures: -10, 60 and 110°C at full and partial immersion. A UKAS (ISO 17025) calibration certificate listing results will be provided in the customer's name. Lead time is typically 6 to 10 days (on top of availability of the block calibrator). For calibration at different temperature points, additional survey points, in a specified well (or wells) or with different customer details on the certificate, please contact us for a price.